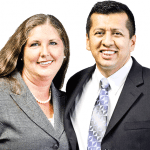 Accountants 4 U, LLC — founded and managed by husband-and-wife Juan and Shirley Sepulveda — is an accounting firm offering bookkeeping, and tax preparation services for individuals and small businesses. They are certified QuickBooks Proadvisors and can support with QuickBooks setup, training, and support. Work For Accountants 4 U, LLC? Claim This Page.